Today's share comes from the back catalogue of the mighty Ogun label and features label co-founder Harry Miller on double bass, flute, percussion and effects. For those that love the sound of solo bass this is a lovely South African tinged recording. 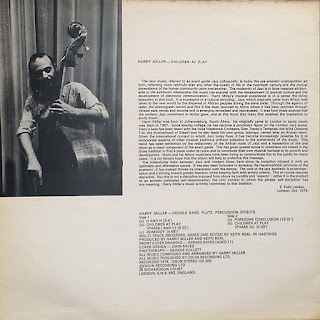 Sadly most of South African jazz bassist Harry Miller's recorded output is no longer in print, although if you are resourceful you may be able to track down original vinyl and some of the CDs. 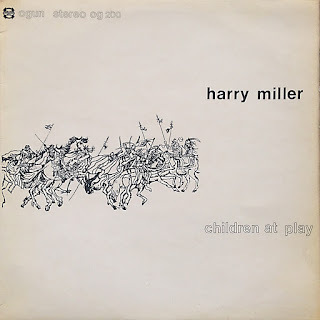 (Try the discog's site for a view of Harry Miller's impressive and near complete discography with some items for sale). Miller was born in Cape Town and in his youth played in rock and pop bands such as the Vikings and Manfred Mann. In the early 1960s he left to settle in England and soon became an established part of the South African exile jazz community that re-invigourated British jazz in the sixties and seventies. He recorded with the likes of Mike Westbrook, Chris McGregor, John Surman, Mike Cooper, Louis Mofolo, Keith Tippett and Elton Dean. Towards the end of the seventies he moved to the Netherlands before tragically passing away in 1983. His widow Hazel Miller still runs the Ogun record label today. If you can get hold of a copy then the 1999 compilation and retrospective "The Collection" is well worth seeking out. Until then try this vinyl transfer that we're sharing today. All compositions by Harry Miller and published by Ogun Recordings Ltd. Many thanks for this record. But is it really complete ? Time of the only track doesn't seem to match with the info on the back cover. Anyway, I can't wait to listen to it. And don't forget his collaborations with Peter Brötzmann and other dutch / german improvisers. Its a single audio file of side A and side B. Apologies but I couldn't determine the track starts and endings plus its a lovely piece to listen to in one go! Ok ! Thank you for the quick answer. My questions was more on the duration of the whole thing because if you calculate the noted durations on the back cover (or on discogs), you arrive at something like 36 minutes and your file last only 32 minutes. I find this kind of thing always a little bit strange. Is it the record company which makes a mistake or the speed of transfer which differs ? Have you the slightest idea ? Thank you in advance and, by the way, sorry for my bad english. Thanks for the feedback. This could mean that my turntable is running faster than it should! Which is alarming. I will need to check this and revert. It could be that the timings indicated on the sleeve are incorrect. Thank you for the update. Very appreciated. This is a great album. Does anyone know if another one, with a similar name, by an associate of Miller, South African saxophonist Sean Bergin, is available anywhere? It's called 'Kids Mysteries' and comes from the same era. @loveletters. Thanks. The Sean Bergin recording you refer to was issued on CD in 1988. See details here: http://www.discogs.com/Sean-Bergin-and-MOB-Kids-Mysteries/release/2919963. It is available on itunes. thank u so much for this gem especially but also all the others here. esp. the south african jazz folks.. magic!!! and the stuff i don't know i am going to check out as well. Words fail me, trying to express how much I love the recordings I've been gifted by Electric Jive, of all kinds. And here's another incredible addition to an already overflowing list. Thank you so much, yet again.